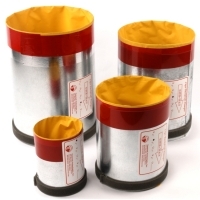 The 4" Cape Backdraft Damper from Tamarack is comprised of a sleeve of fabric bound to a metal duct. The purpose of the fabric is to allow air to efficiently pass through a certain direction of flow with minimum airflow reduction. The damper decreases the flow of air where reverse airflow is concerned. It works quietly, and can be installed in either vertically or horizontally. The Cape Damper won't contribute to enhanced static air pressure as much as the gravity and butterfly backdraft dampers will. While the Cape Dampers do not provide a reverse airflow seal as tight as the spring-loaded butterfly damper, it won't obstruct the forward flow of air in the way other dampers will.